So on my recent trip to State Line I picked up my favorite beer reading material, The Ale Street News. As I leafed through it, I stopped, my head tilted like my dog Griffon when he hears a funny nose. There it was, just exactly what I saw – The Crafty Carton(TM) [TM will be dropped from here on out but is still implied]. One of things that is becoming more prevalent in the craft beer world is beer to go. Most people are familiar with growlers, the glass containers that brew pubs fill with their beer so that you can enjoy it at home. But the landscape of take home beer is changing. Some states (unfortunately not Maryland – the growler service at State Line is still shut down you political bastards – sorry, momentary rant) are now allowing bars to pour any beer they serve into a secondary container so that you can take it home. That being the case, it’s not surprising that people are trying to introduce to the scene a better mouse trap, or in this case a better growler. Enter the boys out at Crafty Cartons. They’ve taken a commonly used, every day container and adapted it for beer use. 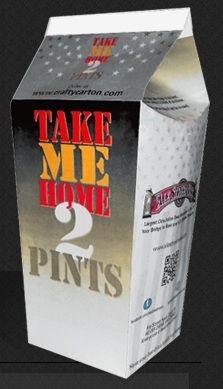 Their answer, the Crafty Carton, resembles a container not unlike a carton of milk or orange juice. The container has many advantages over a traditional growler. First the glass is gone, no risk of broken glass. Second, it’s not clear glass thus eliminating any exposure to sunlight like with a traditional growler. The cartons are far cheaper than glass growlers, thus reducing your price for take home beer. The carton shape makes it fit better in your fridge than a bulky growler. The cartons are proven, they’ve actually been used in Europe for over 20 years and we know how serious the Europeans take their beer. Thanks in advance to Michele (BattyBeerBabe from over at Stouts & Stilettos) for being what I hope will be a good sport about this. I had to laugh because I saw the picture of the carton even before I started reading the article…and I tilted my head to the side just as you described in the first paragraph! Too funny! Those things are awesome–unless, in a sleepy haze, grab it in the morning and pour it on my Cheerios! Wait? What do you pour on your Cheerios? Usually milk, but I might have to try some ‘Beerios’ for kicks & giggles.